Answer: (AP Reply) The Marsh 99 Marker was made to the K-Grade. 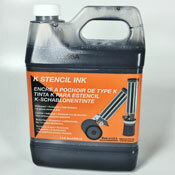 This is a petroleum based ink, there should be no reason to add Pilot to it. Question: does this work in mops? says its good for pouros surfaces but does it work when u write on say transformers or dumpsters?? Answer: (AP Reply) It should work just fine. Question: alcohol or xylene base? & thick/thinness?... is it slightly thinner than Smash but thicker than Transformer/Flowpen ink? anything ink u can compare this to in viscous terms? Answer: (AP Reply) This is going to be the most similar to Money Shot. This will be perfect on it/s own. It will be similar to mineral spirits. (same dude Says:) so like oil-base? any way similar to Do em Dirty Outdoorsman?